This is an original tune I recently composed for B11 tuning. Hope you like it! Attention C6 players: B11 is an easy re-tune from C6 tuning. 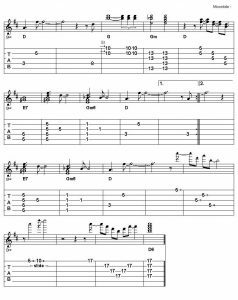 Just tune your C up to C# and drop strings 4, 5, 6 a half-step each. 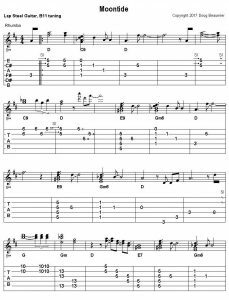 The tablature: When four strings are played together, strum the bottom three strings in the voicing with the thumb and pick the top string in the voicing with a finger at the same time. That makes the high note (the melody) stand out. Notice in measure two that the bar is on fret 1 covering strings 2, 3, 4 and string 1 is played open. Enjoy! B11 is rich in 9th and 7th chords and works especially well for Hawaiian songs. It’s a combination tuning. Part of it is A6 and the other part is B7, B9, B11. There are a few variations of the tuning. The 8-string version I’m discussing here is (high to low) E, C#, A, F#, D#, C#, B, A. 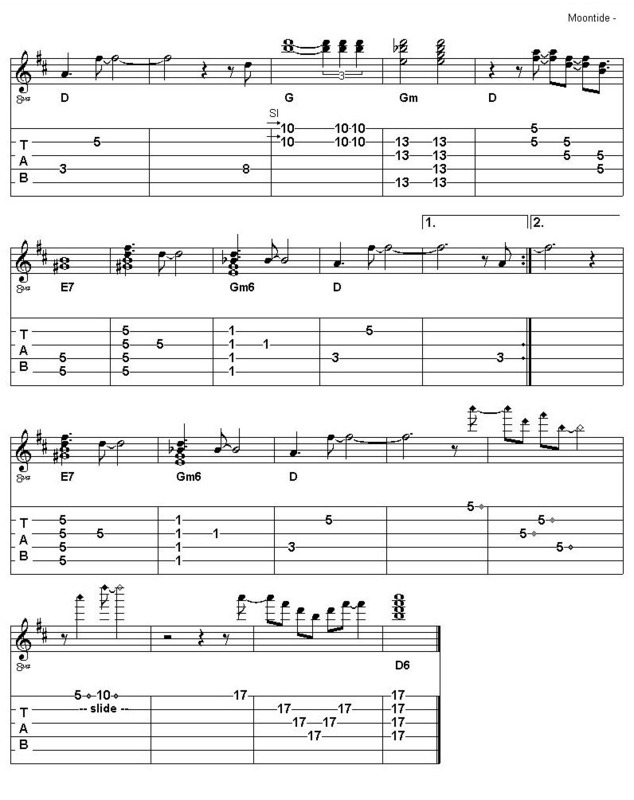 The 6-string version is an easy re-tune from C6 tuning. (high to low) E, C#, A, F#, D#, C# (or B). Strings 1 through 4 are an A6 chord. The middle strings (omit string 1) are B9 (and B, B7, B11). Fret 2 is B6, and Open is B9. Whatever 6th chord you are playing, just drop back two frets for the 7th or 9th chord. 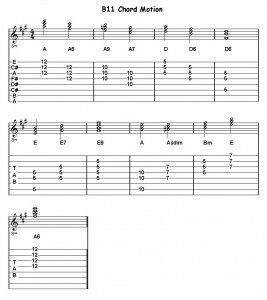 For example, A6 on fret 12 (strings 1 through 4), drop back to fret 10 and play the middle strings (omit string 1) for A9. That big 9th chord is the signature sound heard in Hawaiian songs like “How D’ya Do” and “Sand”. 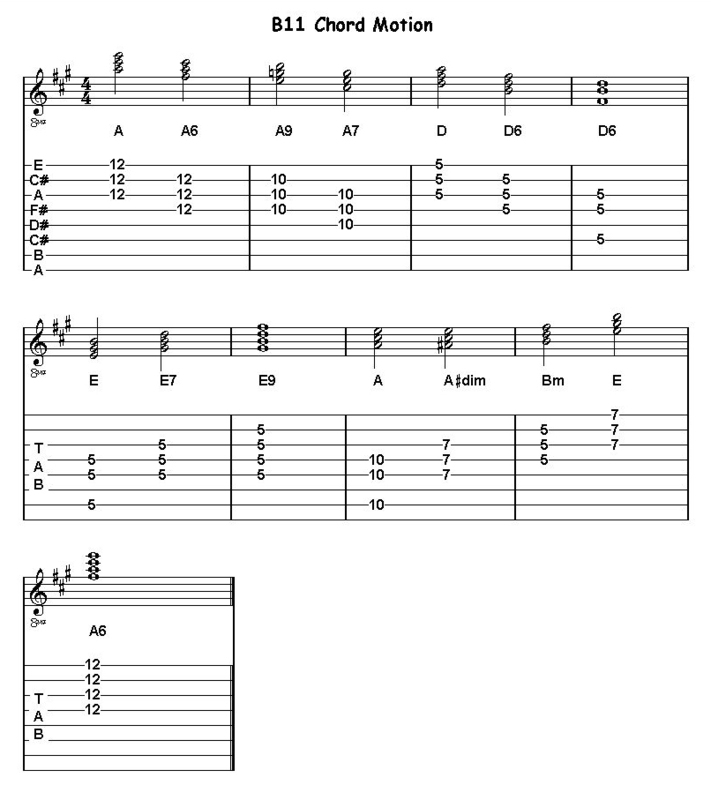 The chart below shows some of the open chord positions, with root note A, root note F#, and root note B. 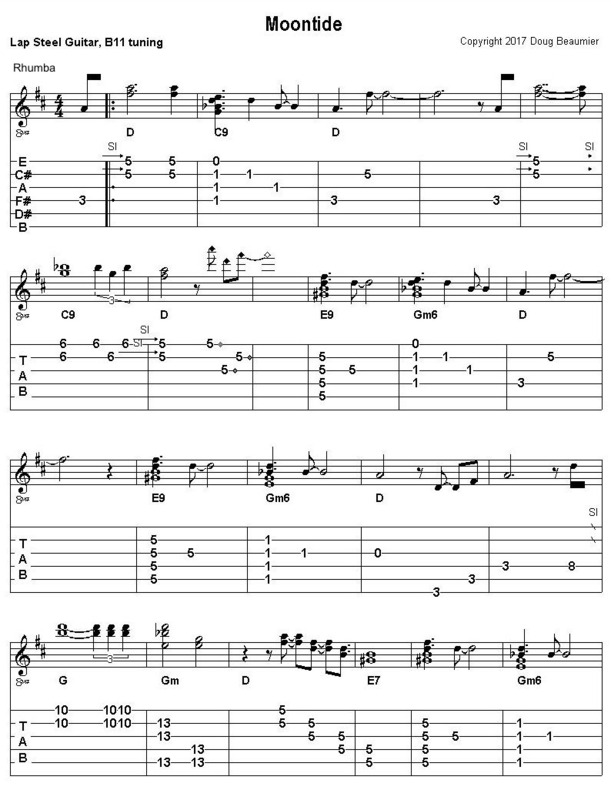 There are other open chords that I left off the chart… diminished chord on strings 3, 4, 5. Also Am6, flat 5, Aadd2, etc.